There are a great deal of benefits associated with a hydronic underfloor heating system. Often associated with luxury and comfort, underfloor heating systems are a wonderful addition to any property. Although you may have heard about the various heating options and systems that are available for your property, you may have some questions about underfloor heating as well as the different underfloor heating systems that are available. How Does Hydronic (Water) Underfloor Heating Work? Utilising a series of pipes connected to your boiler, hydronic underfloor heating systems circulate warm water throughout the floor to heat the floor. 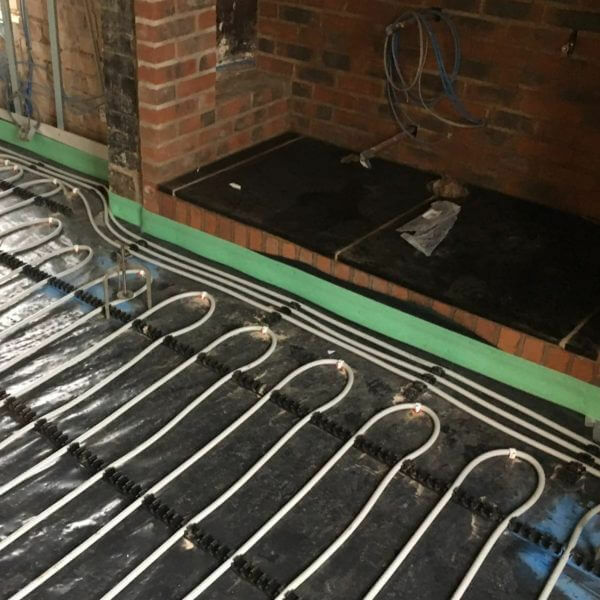 Using a manifold to connect to your heat source, an underfloor heating system is a highly effective and efficient method of heating the floor of a room or even the entirety of your property. The system is a great way to warm floors during a cold day and can be situated beneath most types of flooring. 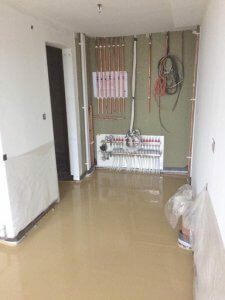 Why is Liquid Screed Often Used Along With Hydronic Underfloor Heating? Liquid screed is often the preferred material for flooring when you are looking to install a hydronic underfloor heating system. The many types of liquid screed that are available supersede traditional sand and cement screeds in many ways. 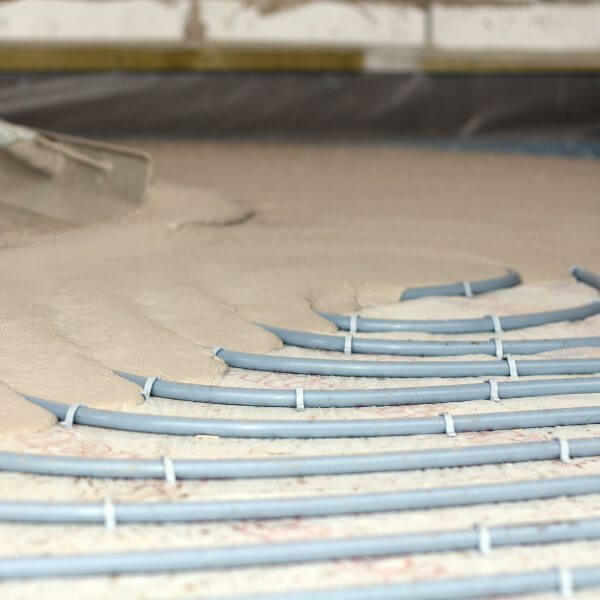 Liquid screed for example offers double the thermal conductivity as sand cement screed (2.2W/mK thermal conductivity vs 1.1W/mK thermal conductivity) which makes your underfloor heating system more energy efficient. You can also walk on the liquid screed floor within 1 to 2 days whereas it takes 7 days before you can walk on a sand cement screed floor. Electric underfloor heating systems are relatively inexpensive to install however it’s important to bear in mind that these systems have high running costs (due to electricity costs.) You also have to be wary of placing heavy furniture on top of an electric floor system which means that you have to arrange furniture specifically. In comparison, hydronic underfloor heating systems have extremely efficient running costs especially when used with liquid screed flooring. 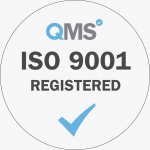 Although the initial costs are higher for the installation process the system runs more effectively and efficiently. How Does Underfloor Heating Compare to Traditional Heating Systems? If you currently have radiators in your property then you may be wondering how this system compares to underfloor heating. Radiators block certain parts of the room which means that if you want a fully open-plan room, then you will have to consider removing radiators in this room. Due to the fact that heat rises, you can expect more even heat distribution from your underfloor heating system compared to more traditional heating methods. Radiators can also be noisy and the appearance may not combine well with the aesthetic of rooms within your property. How Do I Regulate the Temperature of My Underfloor Heating System? The typical way to control or regulate the temperature of your underfloor heating system is through a thermostat. There are also smart systems available which allow for the control of your underfloor heating system through a control panel or phone application. Do I Need to Maintain My Underfloor Heating System? Underfloor heating systems (if installed correctly) should require very little if not no maintenance whatsoever. Should the underfloor heating system be installed incorrectly then this can cause issues and the system will require maintenance in order to rectify the issue.  This is why it’s important to work with a qualified, professional and experienced underfloor heating installation company if you are unsure about installing an underfloor heating system yourself as you risk the incorrect installation of your underfloor heating system. 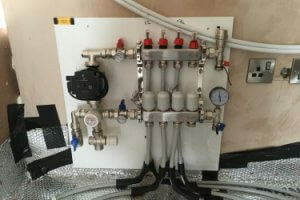 If you are looking to install an underfloor heating system then it’s highly recommended to work with an expert company such as the professional team at Easyflow. Which Rooms Can Benefit from Underfloor Heating? From your living room to your bathroom, there are many areas in which you can enjoy your underfloor heating system. They can be a wonderful addition to your bathroom when you step out of your shower and are greeted with a lovely warm floor. In essence, an underfloor heating system can be installed around your property and can even be installed in areas such as garages. Does Underfloor Heating Take a Long Time to Heat up and Cool Down? A good system with intelligent controls that are correct for your requirements allows you to pre-programme heat up times which you can turn on before hand. This makes sure that your underfloor heating system is at the correct temperature exactly when you need it. If you are using intelligent controls then these can even build a pattern of your heating requirements and this can also be used for cooling down periods. Does an Underfloor Heating System Guarantee Even Heat Distribution? Your underfloor heating system effectively operates by turning your entire floor area into a radiator. Due to the fact that your floor has a large surface area, heat rises steadily upwards ensuring that there is even heat distribution and no draughts or cold spots in the room. This makes your room very comfortable and again heats the room more evenly than traditional radiator based central heating systems. You can even use underfloor heating systems in combination with other heating systems if you still wish to utilise radiators alongside your underfloor heating system. Underfloor heating systems also work and in and with a heat pump which is ideally suited for producing the low temperature that is required for your underfloor heating system to operate.